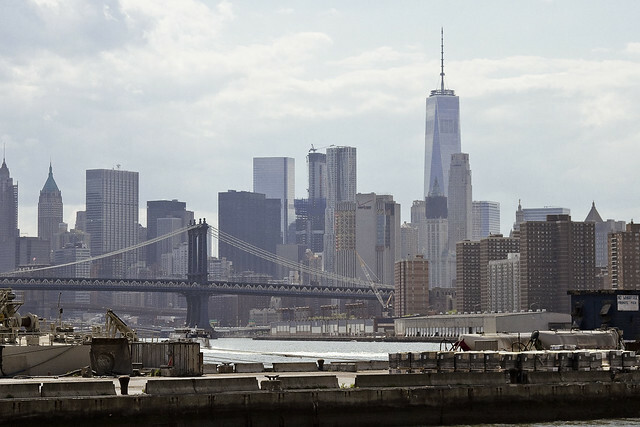 Pictured above, a view of lower Manhattan from the Wallabout in Brooklyn. 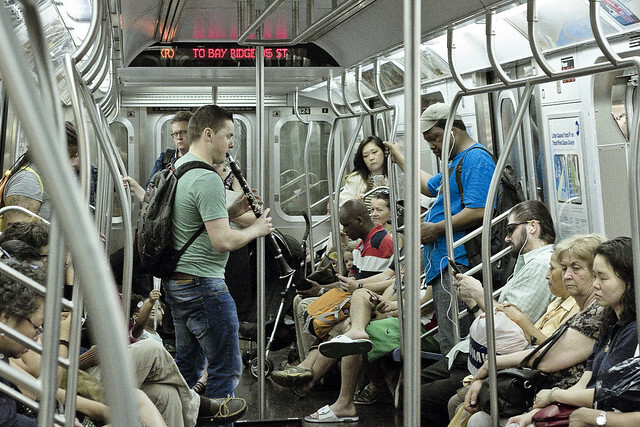 Unsolicited criticism number 1 is offered to my fellow riders of the NYCTA Subway system. For the love of god itself, use your freaking headphones when you’re playing a video game on your phone while riding the train. It’s bad enough that I’m being subjected to evangelist Korean guy and to jazz busking. Do I really need to listen to the stupid beeping and blinging that your game is making? Unsolicited criticism number 2 is also aimed at my fellow riders of the Subway system. I am certain that allowing me to exit the freaking train will not, in fact, cause you to not be able to get onboard. Pushing past someone like me, a veteran of 1980’s NYC’s punk scene, means that you will – in fact – find yourself bouncing off of a stranger whose elbows are far sharper than yours. 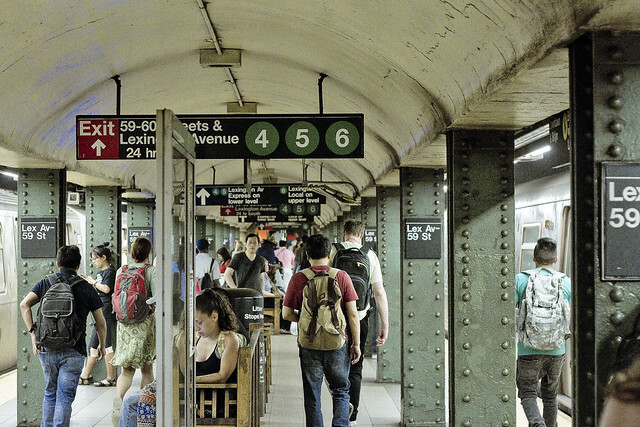 The worst offenders on this subject are found at the 59/Lex stop. Do you really want to experience the “people moving” techniques I learned in 1980’s mosh pits? Then wait your turn and let me get off the train before you enter it. Unsolicited criticism number 3 and 4 are offered in the shot above. First, the solar powered garbage cans that the urban planning geniuses of Pratt University have been placing around Lower Manhattan and the tony sections of North Brooklyn. Let those words roll out of your mouth – “solar powered garbage cans.” Do you have a fossil fuel powered garbage can in front of your house, lords and ladies? Was this a problem that needed solving? 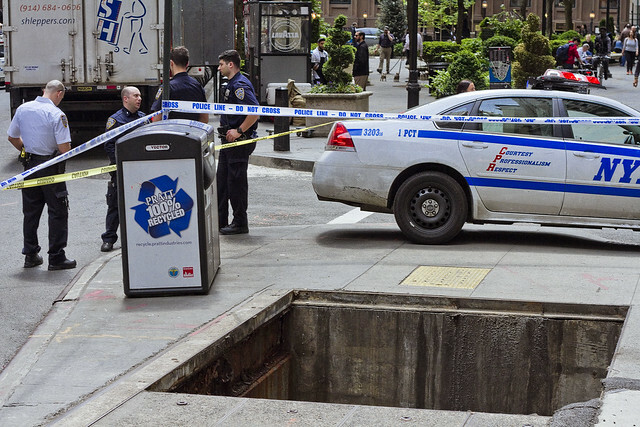 Secondly, the giant pit you see above – according to the NYPD personnel I asked about it – used to be a subway grate on Pearl Street in Lower Manhattan. It seems a truck driver decided to use the sidewalk to bypass a parked car and discovered that a sidewalk grate wasn’t designed to carry the weight of a truck. Fellow New Yorkers – NYC streets are color coded. Black pavement is for vehicles (including Bicycles, Delivery bikes, and trucks). Gray pavement is for pedestrians, baby carriages, and “not vehicles.” Stay the feck off the sidewalk.